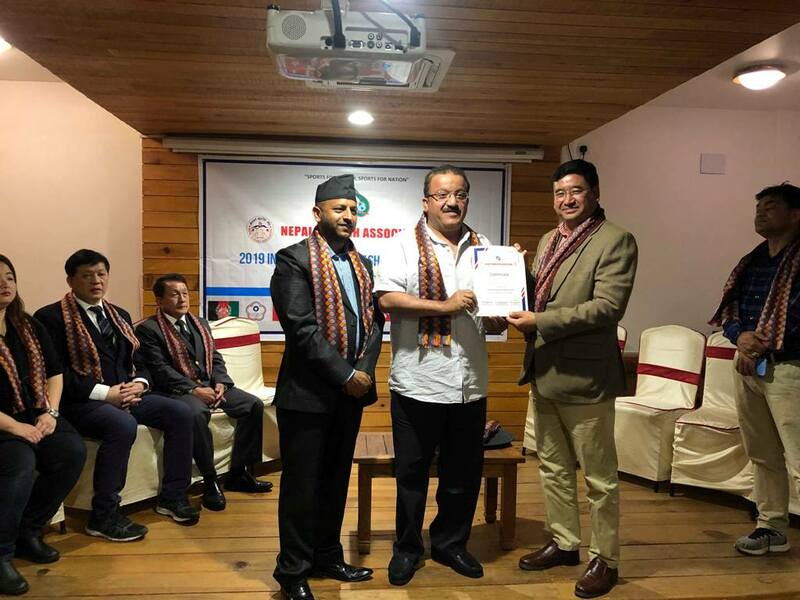 President of NOC/Member of Parliament Honorable Jeevan Ram Shrestha was the chief guest in the closing ceremony of International Kurash Referee Seminar-2019 which is an official program of International Kurash Association in which 8 countries have participants Taiwan, Indonesia, Hong Kong , Kuwait, Tajikistan, Thailand,& Afghanistan on which we have Lecturer from Thailand which is being held in Pokhara. 19 Participants from Nepal and 15 Participants from other countries participated in the program. Honorable President Shrestha congratulated Mr. Dhurba Neupane (President of Nepal Kurash Association) for organizing this program and said that Well expertise (Referees) is needed to have free and fair competition so that the seminar will be a mile stones to produce technical personals to organize the International Championship. The two days program had special guests Honorable Kusum Kumar Karki, Member provision no.3 Assembely, Western Regional Sports Development Committee President Sampana Shrestha, Deepak Godar (Treasurer) Kaski district Sports Development Committee; and international special guests from Kuwait- President of Kuwait Kurash Federation Mr. Hameed Farman,President of Hong kong Kurash Association Mr. Chow, General Secretary of Chinese Taipei Kurash Federation Ms. Kai Feng Chang & Lecturer of International Kurash Association Mr. Pulsak from Thailand. The main aim of this seminar is to develop International Kurash Referees from Asia to be updated with latest rules of Kurash.